As a Franciscan friar, I believe that gratitude and joy are as much of our charism as poverty and fraternity. There are a lot of good reasons to be angry today. When we look around and continue to see injustice in our government, our church, our cities, and in our homes, it is more than acceptable to get angry and to turn that anger into constructive change. To go through the world with a critical eye, a strong sense of purpose, and the perseverance to make a change is much needed. As I get more involved with the church and the issues relevant to it, I find myself fueled by anger more and more. How can I not when I see the things I see, done to people for which I feel so passionately about? How can I stand content with so much wrong with the world around me? I can’t, I tell myself. When I find myself going down this road, what always brings me back is a reminder to have an attitude of gratitude. Sure, it sounds a little cliche, but it’s much more than just a self-help/mind-over-matter gimmick: it’s a theology. To go through the world with an attitude of gratitude, even in it’s most frustrating times, is to recognize the goodness of the God-incarnate in the world. How often do we call to mind the endless gifts we’ve been freely given without merit or entitlement? When I do, it reminds me that I’m not in control, that there is something outside of myself capable of so much more than I am. It reminds me why there are things worth getting angry over in the first place, but grounds me to know that I can’t solve the world on my own. At its best, it reminds me of how wonderful all of creation is, gives me a greater perspective on eternity, and abates my anger completely because I know that everything will work out in God’s eternity. This absolutely does not mean I wish to slip into a state of apathy because “God will take care of it,” nor does it mean that we should work any less for the sake of justice. Such attitudes are at best a self-therapeutic conception of God, focused entirely on the self. No, what I mean to say is that Love is more powerful than Hate; optimism more inviting than pessimism; praise more constructive than criticism; and gratitude more life-giving than complaint. Even when faced with life’s most challenging issues, in times when we have nothing but anger and frustration, we still have a loving and merciful God that has blessed us with abundance at every turn. Why should we believe that the future will hold anything less than the same outpouring of gifts we have already encountered, or that tomorrow’s problems will somehow be beyond the reach of God’s intercession? 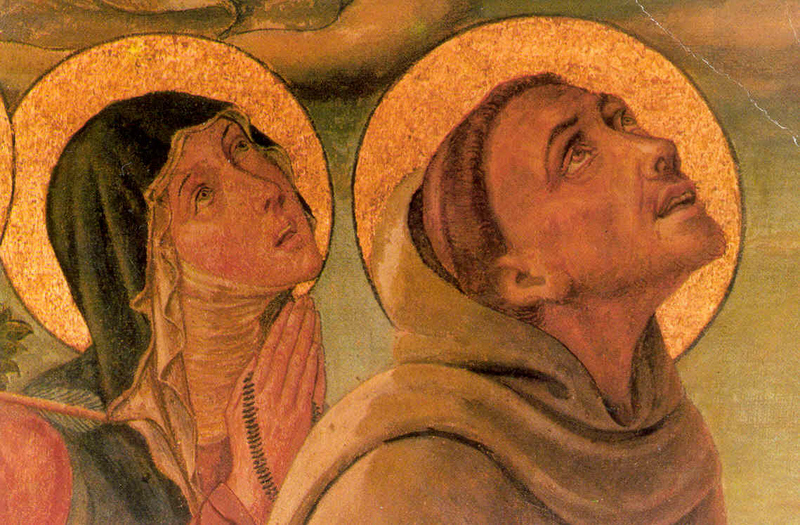 As a guide, who could be better than Francis of Assisi? Surely there is no one in history that praised God more often or more completely than the little poor man from Italy, even in the harshest conditions. I believe that joy and gratitude are as central to our charism as poverty and fraternity, and it’s the model I’m trying to adopt today. I have enjoyed your words and through the blessing of meeting your Mom through work, she thought I may enjoy reading your blog. I also shared in conversation with your Mom a mission I have been on with the eternal lives of all faiths. As a Catholic, who felt uncertain of my salvation that was not shared during my years in school or church, brought me to Christ through the gospel being shared by a friend. All that said, may I ask if the Catholic church gives the gospel to its congregation that to go to heaven they must have a personal relationship with Jesus Christ through the confession of our sin and recognizing that Jesus died on the cross for our sins and lastly to desire a personal relationship? I know that the confession is through a priest and I also know that we can directly confess our sins to our Lord and Savior. Please help me with my inquiry with your thoughts. As the next generation of priest I pray God’s people receive the truth of eternal salvation. Mary, thank you very much for your comment and thoughtful question. I’ll do my best to answer what I think you’re asking. The Catholic Church believes that Jesus of Nazareth is both fully human and fully God, the second person of the Trinity incarnate as a human being. Jesus lived on earth, experienced human weakness, remained faithful, suffered, died and was buried. He was raised from the dead, and is again with the Father and the Holy Spirit. Catholics believe that salvation is granted to us through God’s grace, his “freely given, unmerited favor,” and is not something to be earned or worked for. Nothing we say, do, or believe will guarantee us salvation because we do not have power over God; if God wants us to be saved, it is through his power and decision alone. I hope that helps. Thank you again, and may God grant you his peace.